I tried to imitate the patience of acetone, and make a real landscape by Lake Baikal (Russia) for the community. Every day added something, in order to finish it ,,,, but it was impossible. 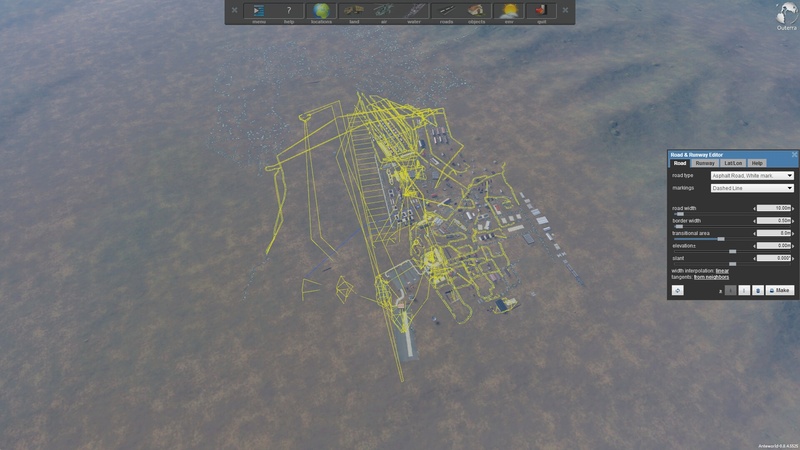 Every time I wanted to change something of the runway, it gave me error and was expelled from outerra. The problem is the road and cracks in the mesh, because when they collide or overlap, you can produce a fatal error. It all started when I tried to hide a crack or cracks them on the spot, adding to it a road that dissimulate it. The result was fatal, since not only did not let me add any road, but I constantly outerra expelled outside. 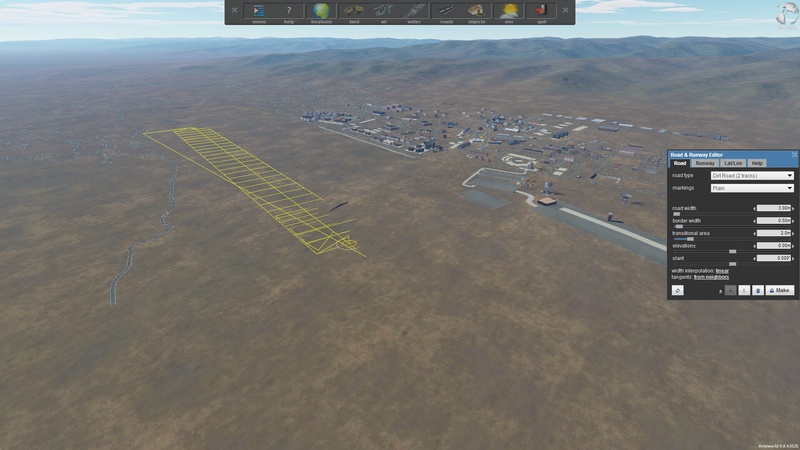 I deleted all the airport to rebuild it again, but it was too late, did not let me do anything, no roads are represented and kept driving me ,, so the city was left without its airport Internancional Baikal. I was fortunate to make some shots before the disaster and with them I could make this video. Do you remember what error it was? I'm really curious because I've seen my share of road bugs but nothing like what you describe. Is the location still present in your cache folder? If you want, I can take a look at it, just send me your entire cache folder in your outerra user data directory (maybe your packages folder too, so I can test the area with your models. Edit: Looking at your video, if the "cracks in the mesh" problem is the one visible at 1:21, it's a problem happening when there are too much nodes close of each other in a very large road. It can also be related to a conflict between two transitional areas. to explain better we will identify the error. across Lake Baikal it is Irkutsk airport is not the best choice,, but it's a nice place to break a pair of tights. El editor crea automáticamente muchos nodos intermedios. ¿Qué sucede si borras esos nodos y sólo dejas el primero y el último? I think the " bug " is known by the guys outerra, but it would be unfair to call it conflict mistake, let's call. what happens is that when the road split the next node is not in place it back, rises or just sinks. it really is a drawback because it slows you down. but do not worry,, we have the best. Let's see what really happens at the first airport in the fissure that causes the problem. Ok, I think I found the problem. Brace yourself. First, you have several phantom roads here. These happens sometimes where you place a really large and long road, it happened a lot to me when I was leveling the terrain for the Talkeetna river. 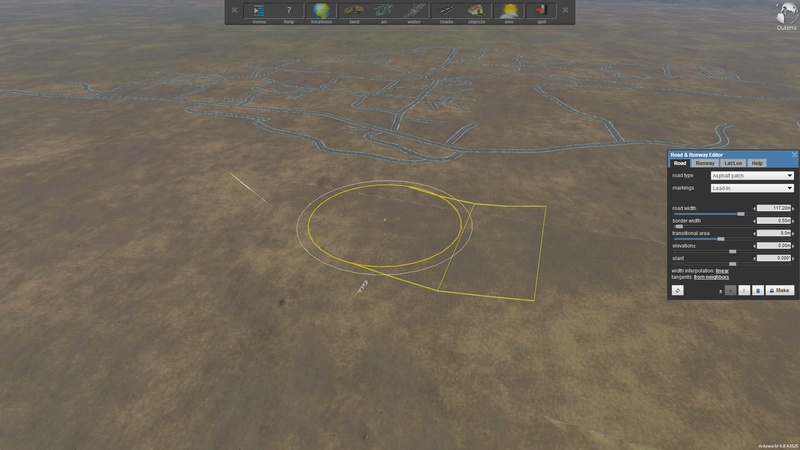 They appear as 3-4 nodes long roads, not visible but messing up with the terrain. Really hard to spot, select and delete, there are often several versionq of these at the same spot. A bug, indeed. Here is an example. This one was under the terrain, so I elevated the nodes to make them visible. Deleting this road don't make the game crash. I don't really understand how it's possible, but all the roads you placed in this area had been duplicated in what seems like a monstrous thing from an other realm. 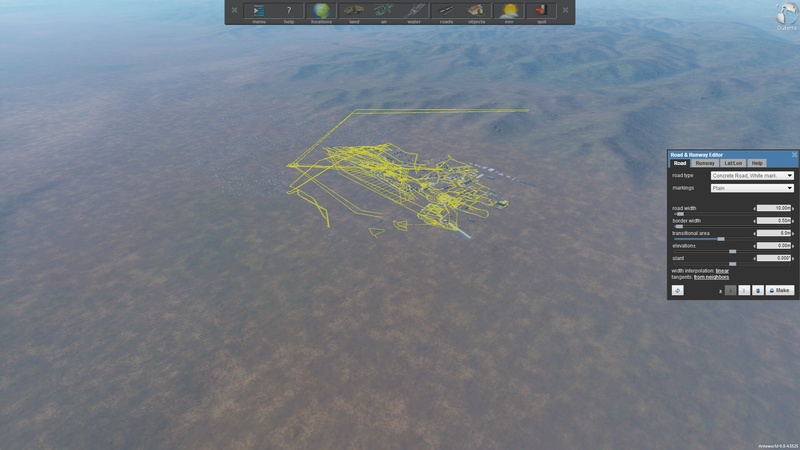 As you can see, it's your airport vector, but duplicated and looped (in a really weird way, I was originally thinking there are several nodes under the ground). There is already a good runway road, but even is the vector is here, the surface is not displayed. Indeed, modifying it makes the engine crash. 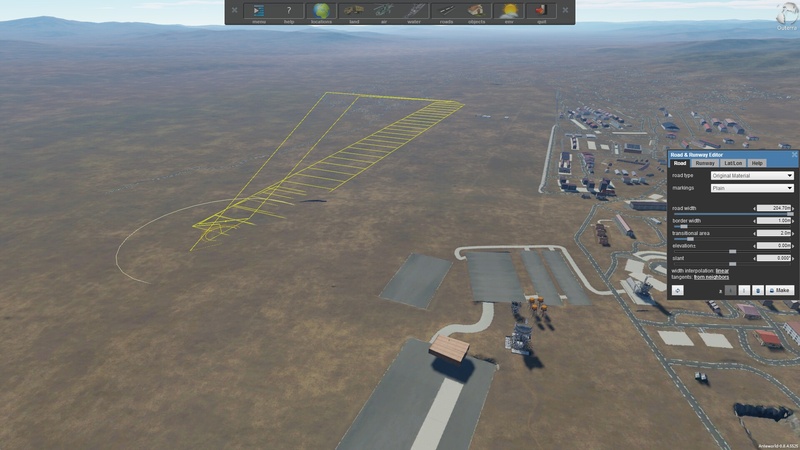 Same for this fake looped version of the airfield. You see the little yellow dot, left of the city? It's the node I'm currently selecting. It's a part of the whole thing. An other example, this time, under the middle of the city. At this point I was pressing the delete key like a crazy and still couldn't reach the visible nodes yet. Ok, this is new. At first I though you created the whole area using a single road, but it is indeed not the case, the original roads are ok and everything. But somehow, this lovecraftian abomination managed to duplicate the entire area vectors in a single road. Of course, deleting it or modifying it creates an instant crash. I bet it is covering a single tile. Option 1 : Going micro and try to edit the hex file for the tile, trial and error testing the area to see if I can put down this beast. Option2 : Option 1 don't work and we need to delete this tile. It will be necessary to remake local roads (only where this thing appears), but at least you will not have crashes anymore. I can help. I guess trying to repeatedly resurrect that could cause this thing. Anyway, I fixed it, just not sure if it will be able to handle this damaged state. I have to say in my defense ... I have nothing to do with that witchcraft. Lake Baikal is a place that will soon be very popular, as the next James Cameron film "Avatar2" is inspired by this huge lake of 31500 km2, freshwater "Ocean of Pandora". In the depths of 1350 m are over 800 unique species on the planet, you have served increased in the film as strange beings. Once they arrived in Irkutsk (Siberia) they moved south of Lake Baikal where they made a dive with Mir bathyscaphe (much like the mod Sub Shere our partner andfly) with his friend Anatoly Sagalevich, oceanographer and president of the Foundation for Protection Baikal. Community-wide exclusive overfly the area ..... "Pandouterra"
ohA ... Heinkel over Baikal lake ... plus of Legion Condor ... that's something new. Genosse Sralin Stalin is determined to turn around in the grave. Only parts of the story are known ... and usually the version of the winner. The February 24, 1937 this aircraft piloted by Hans Hptm.Otto (winter) was damaged during combat with Republicans fighters, Spain and forced landed behind the front line. He was captured by the Republicans (Spanish Civil War), was repaired and flew. He was then handed over to the Soviets and in the spring of 1937 was tested in NII VVS in the USSR "Institute of Scientific Soviet Air Force Research (NII VVS), in Russian. Научно-Исследовательский Институт Военно-Воздушных Сил СССР"
Who knows if flew the big Russia.